Milestone Systems celebrated a successful 10th year at Intersec, looking towards the future of video management systems. Director Christian Ringler, Milestone Middle East, Africa and DACH, outlined the exciting possibilities of intelligent video in an engaging keynote speech, while the Milestone community partners showcased innovative AI-based technologies at the crowded Milestone booth.Milestone Systems, the open platform company in network video management software (VMS), celebrated it’s 10th successful participation at the IntersecExpo in Dubai recently. The region’s leading security and safety trade fair this year saw more than 29,000 visitors from 120 countries. 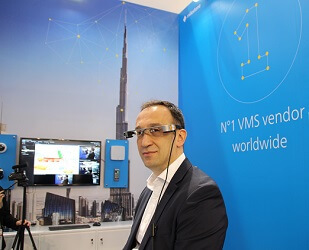 At the Milestone booth, visitors showed a keen interest in the latest release of the XProtect Video Management Solution, the company's visions for intelligent technologies and innovative solutions from the Milestone Partner Community. In an engaging keynote speech at the Intersec Conferences, Milestone Systems’ Director Middle East, Africa & DACH Countries, Christian Ringler, outlined how Milestone Systems is on a journey towards the next video revolution. "In every field of business there comes a time of disruption; for video security systems this time is now. We are entering the age of intelligent video systems. Advanced technologies are here today, already changing our near-term future rapidly, and creating new possibilities for surveillance and beyond," said Ringler. This step into the world of intelligent video is not a step any VMS manufacturer can take alone. There is a need for highly specialized knowledge and new specialized services. This can only be delivered by a community of hardware, service and solution partners sharing their innovation with the wider community. At the Milestone stand this year, nine solution partners presented advanced solutions for the future. iCetana showcased proven AI-Assisted Video Monitoring software with Milestone, and comments: “Being part of the Milestone showcase at Intersec was a great opportunity for iCetana to demonstrate its AI technology in the marque security event for the region. Our partnership with Milestone continues to be important, valuable and rewarding for iCetana," said Chris Farquhar, CEO of iCetana. “Intersec 2018 was an excellent exhibition and being on the Milestone stand was a fantastic opportunity for Ipsotek to talk about our latest innovations and the initiatives which Milestone and Ipsotek are collaborating on, such as the Milestone marketplace and the GPU VPS platform for video analytics," said Dr. Boghos Boghossian, Chief Technology Officer, Regional Sales Director, Middle East, Ipsotek. iCetana AI-Assisted Video Monitoring software, See Things Differently. Ipsotek scenario based video analytics software solution boasts a set of advanced, automated video analysis tools that provide real-time detection, extraction of events and valuable data from surveillance footage to help businesses increase their return on investment, improve overall security, safety and operational efficiency. P2 a leading wireless mesh technology company offering flexible and expandable network solutions for bandwidth-demanding applications and mission-critical infrastructure with R&D offices in the USA and Hong Kong. Prysm software provides open platform command & control systems for mission critical security management, building access control and energy management. NetApp is the data authority for hybrid cloud by providing a full range of solutions that simplify the management of applications and data across cloud and on-premises environments to accelerate digital transformation. Rasilient Systems a global supplier of servers and storage systems with purpose-built technologies enabling Forensic-Grade IP video surveillance applications. 6SS a Technology Consultancy and Training firm geared to provide full design, solution architecture, project management, professional services and customized software development & integration. Solus provide Advanced Access Control & Security Solutions. Seagate world leader in storage solutions.